I made a mount using one of those cheep spring clamps the big box stores sell. 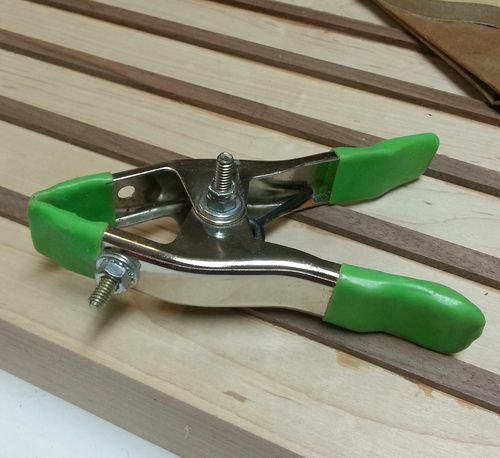 I added a 1/4×20 bolt and nut to the handle so you can clamp it just about anywhere. Your mount would attach to it nicely…like clamped to a bookshelf, chair, you name it. Here is an example. I used a larger claamp. As you can see, it holds the Speedlight with no problem. Good job mate…..combining your passions and saving money at the same time, always good !! Thanks guys for having a look. Michael, I love your idea. Endless possibilities. What is the pivoting gubbins between speedlite and clamp? Did you make that too? I like your avatar too. Canon L lenses….mmmmmm! Gordon, thanks for your comment. I like saving money. How’s the mouth doing?! It is an umbrella adaptor for a light stand. I got it from flashzebra.com. He has a lot of goodies for speedlights. Below is a pic of the clamp I was trying to describe. I replaced the center pin with a 1/4 inch bolt and mounted a shorter 1/4 inch bolt on the handle. Pretty handy. Thanks Michael for your response. A clever idea indeed. Great thinking. My wife is a Photographer, I’ll show her this post she may be interested (and I might have more added to my to do list). Thanks for posting. Great idea and solution! Another great and creative use of scraps. Way to go!